If you’ve ever wondered what it’s like to see the world through the crazy eyes of very crazy Vincent Van Gogh, now you can. 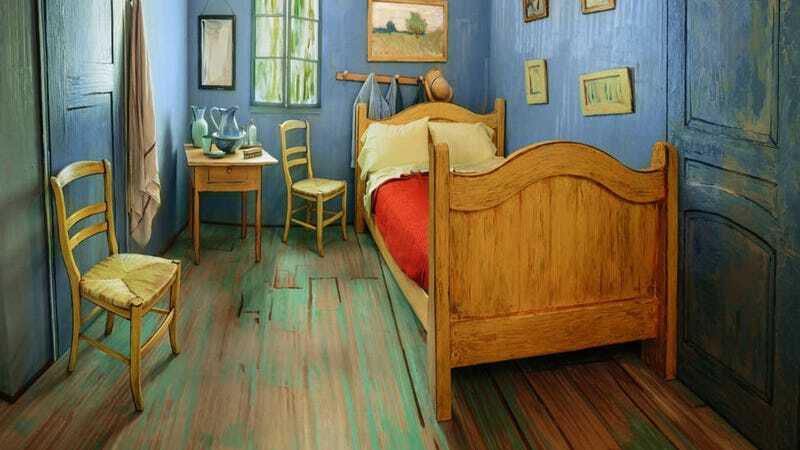 The Art Institute of Chicago built a life-size replica of his popular painting, Bedroom In Arles. The room is available for rent on Airbnb starting today, and judging by the photos, it’s a nearly an exact replica of the famous painting. The rental was built to promote a new exhibition, Van Gogh’s Bedrooms, that opens at the museum on February 14 and runs until May 10. The exhibition is the first time that all three versions of the painting will be shown in North America, and it includes several extra presentations, including a digitally enhanced reconstruction of the room—you can’t sleep in it, but you can interact with it to learn more about new scientific research on the painting. If you’re lucky enough to get one of the coveted spots for this Airbnb listing, you’ll be allowed to bring a friend. The room accommodates two people and even comes with a bathroom. More importantly, the room only costs ten bucks per night. “I’m charging $10 for no other reason than that I need to buy paint,” says the description of the room, written as though it were penned Vincent Van Gogh. “However, I will be happy to provide you with tickets to my exhibition at the Art Institute of Chicago.” What a deal.